“It will be so loud that if we moved in next door to you, your lawn will die” is what Motörhead founder, voice, and bassist Lemmy Kilmister has reportedly said about his band's music. Last Monday, while the power trio's 40th anniversary tour stopped at San Francisco's Warfield Theatre, fans could hear for themselves whether Motörhead is truly “louder than anyone else.” The consensus was that there is no arguing with the legendary frontman who has 22 studio albums under his belt and has sold more than 15 million records worldwide. Unfortunately, there was no lawn to kill in the Warfield's immediate vicinity, but finding out exactly how many decibels the historic venue will be able to withstand appeared to be an easy second choice for Mr. Kilmister and band mates. Needless to say anybody who wants to stand a chance of opening for the “Loudest Band Ever” needs to know how to turn up the volume. British rockers Saxon seemed all too familiar with that dial and magically catapulted the audience back in time to the heyday of heavy metal with their unique riffs, song structures, and an overall sound that now belongs to the Zeitgeist of the past. It was refreshing to see the Brits still going strong after over three decades of rocking, and many are looking forward to the release of their 21st studio album “Battering Ram” this October. During the intermission those in attendance who didn't have their ear plugs ready yet knew to quickly get a move on as equipment was briskly moved across the stage and a huge Snaggletooth banner with the words “victoria aut morte - by victory or death” became clearly visible. Not long thereafter Lemmy, guitarist Phil “Wizzö” Campbell, and drummer Mikkey Dee appeared, and fans were welcomed with their signature greeting “we are Motörhead and we're here to play rock and roll.” With that said hands were raised in the air and bodies started slamming into each other in the large mosh pit on the main floor. Despite the imminent release of the band's 22nd album “Bad Magic” the setlist pleased fans with lots of classics. “Damage Case” from the 1997 album “Overkill” started the auditory attack followed by “Stay Clean” and “We are Motörhead.” Lemmy, dressed in black as usual, with a black hat and red foot gear, sounded as great as ever. Just as fans have come to expect, the lead singer left excursions to the front of the stage to guitarist Campbell and stayed put behind his microphone taking an occasional sip of his beer. Although Lemmy's larger-than-life persona often stands in the forefront, due respect must be paid to his band mates. Phil Campbell did not only relentlessly work the crowd but dazzled fans with a beautiful guitar solo. During “Dr. Rock” (Orgasmatron, 1986), Mikkey Dee, who was very strong all night, impressed with a thunderous drum solo. The three musicians worked together like a well-oiled machine, and the sound couldn't have been any better or louder. The set concluded with more hits such as “Just 'Cos You Got the Power” (No Sleep at All, 1988) and “Going to Brazil” (1916, 1991). The most famous “Ace of Spades” (Ace of Spades, 1985) was preceded by a warning from Lemmy: “This is the last song of the night unless you make some noise.” The crowd was more than obedient and hence earned the encore “Overkill” (Overkill, 1979) and the heartfelt compliment “you've been a lovely crowd tonight!” It suddenly became quiet again in the beautiful theater which luckily remained undamaged. Motörhead will continue to make very loud music across the United States until the end of next month and then move on to kill lawns and shake buildings on the other side of the Atlantic Ocean. Drama is no stranger to Van Halen, one of the most successful American rock bands in history. Over the course of their long and prosperous career the group has undergone a few not-so-amicable changes, some of which were accompanied by public statements of dismay. Despite the seemingly tumultuous relationships between band members, the quartet has written and performed some of the best known rock songs of the past four decades and has sold over 80 million records worldwide. July 5th marked the beginning of Van Halen's current North American tour with all-time members Alex and Eddie Van Halen on drums and guitar, Eddie's son Wolfgang on bass, and David Lee Roth on lead vocals. Due to the release of their live album "Tokyo Dome Live in Concert" just a few months ago, thousands of fans in every major city once again eagerly awaited a display of enormous musical talent accompanied by a measure of unpredictability capable of taking the entire show in a whole new direction. The well-documented tension between the band's guitar virtuoso and its flamboyant frontman has spilled over onto the stage in the past, and Roth's inconsistent vocal performance almost begs you to place a wager on whether he's going to absolutely nail or terribly butcher the next song. Nevertheless, or possibly exactly because of that, over 10,000 fans came to the Concord Pavilion on July 9th to see their favorite band. Many appeared instantly mesmerized as the rockers took the stage with whirlwind opener "Light up the Sky" from their 1979 release Van Halen II. "Running With the Devil" ("Van Halen", 1978) was a great strategic move as a follow up keeping the momentum alive. The whole stage was illuminated with red lights and David Lee Roth immediately started working the crowd, kneeling down in front of hypnotized fans. "Everybody Wants Some" ("Women and Children First", 1980) and "Feel Your Love Tonight" ("Van Halen") were also great choices and definite crowd pleasers. About ten songs into the set, Alex Van Halen delivered a skillful drum solo. Fans took in every beat and appeared to love every minute of it. The slightly older one of the Van Halen brothers, Alex proved to be in great shape. Looking slick with his dark glasses he appeared to enjoy not only his time in the spotlight but the entire show. At the end of his solo he stood up, thanked fans, and appeared genuinely gratified. The 25-song set continued with a mix of greatest hits and songs that haven't been played live very much, at least not for quite some time. "Women in Love" ("Van Halen II", 1979) was reminiscent of old times, especially when Dave was joking around with Eddie in between lines. "Ain't Talking 'Bout Love" ("Van Halen") was another crowd favorite, and loud screams prompted the frontman to turn directly to the audience announcing: "I'm just feeling good. How about you?" Overall, Diamond Dave appeared to be his dazzling self minus a little hair and some height on his signature karate kicks. His big smile, his grand gestures, and many wardrobe changes were all still the same. His comments and stories continue to bear undeniable parallels to his singing: sometimes hilarious, sometimes a little inappropriate, but always entertaining. He sounded amazing during quite a few songs, such as "In a Simple Rhyme"("Women and Children First"), "Ice Cream Man" ("Van Halen"), and "Unchained" ("Fair Warning", 1981). In all fairness, Roth's vocals are as unique as his antics, and his fans, who know to expect the unexpected, love him for exactly that reason. When it was time for Eddie's guitar solo, the gears abruptly switched from unpredictability to dexterous precision. Not many guitar players are able to captivate an audience with such skillful and distinct styles as this accomplished master of the six-string. Eddie showcased some of his signature styles, among them a technique called "tapping" which he is pericularly known for. It was a great pleasure to watch him elicit such beautiful sounds from his instrument with such ease. The roughly two-hour show wrapped up with a few more big hits. Kinks' cover "You Really Got Me" was part of the package, as well as "Panama" ("1984", 1984), which elicited a strong reaction from the audience. Finally, Roth addressed fans one more time asking: "Do you want to hear the encore?" knowing that this had to be a rhetorical question. "Jump", Van Halen's one and only number one on the US Billboard Hot 100, fit that slot perfectly with its high energy and Roth twirling a baton. When everything was said and done, fans had no reason to be disappointed. May their personal relationships be as they are, on stage everyone did their part, from the Van Halen brothers' amazing drumming and strumming to Diamond Dave's exquisite showmanship. Not to forget Wolfgang Van Halen who was not only amazing on bass but was also instrumental in teaming up with his dad to save the day more than once with great back up vocals. Fans left happily hoping that the sentiment was equally peaceful backstage. After playing only a few select dates last year following the release of their latest album "Monuments to an Elegy," the Smashing Pumpkins have joined forces with Marilyn Manson and embarked on a North American co-headlining tour. The "End of Times Tour" started in Concord, California on July 7th and will wrap up on August 9th in Nashville, Tennessee. 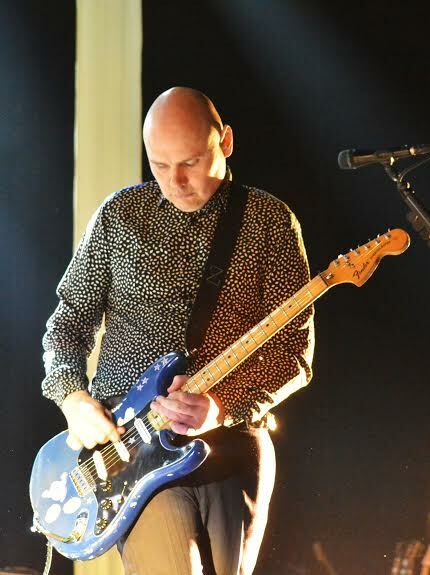 Billy Corgan and collaborators were well received by fans during their opening night and played many of their old hits. (See below for a complete set list.) The band was re-joined by original drummer Jimmy Chamberlin. 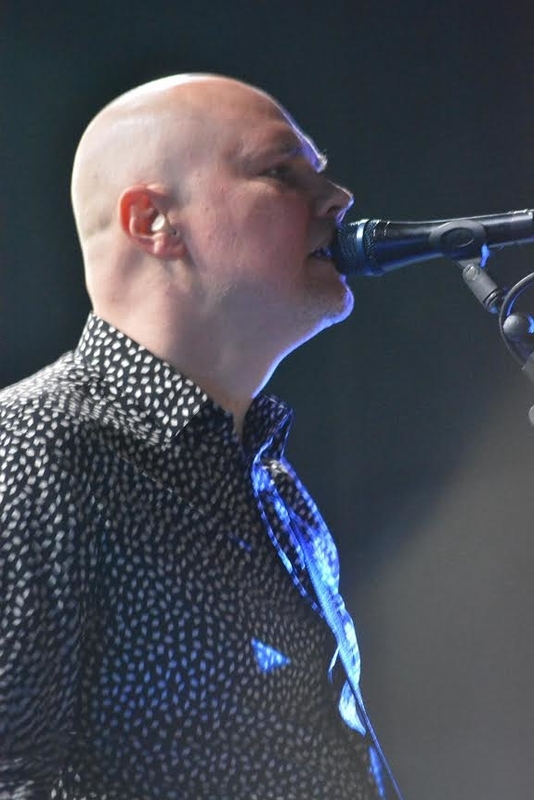 After struggles with their musical direction and a break up in 2000, the Smashing Pumpkins appear to be back to not only create new music but to enjoy and honor their past success. Frontman Billy Corgan just recently tweeted: "It's time to celebrate the legacy, camaraderie, the journey, the kinship, and the band's unique relationship to fans." He portrays the ultimate villain. He is the Antichrist and the self-proclaimed God of F***. Worshipped by fans, condemned by conservatives and blamed for many things gone astray in this society, his image has become larger than life perfectly reflecting the juxtaposition of his stage name. People either love or hate him; with Brian Hugh Warner, aka Marilyn Manson there isn't much in between. His power lies in his ability to create controversy, such as luring religious activists away from feeding the homeless and other good deeds to rush to his shows and harass concert goers instead. Last Tuesday, the rocker, who discovered his attraction to things one isn't supposed to do while attending a Christian school as a child, set out to bring chaos and non-conformity to the beautiful Concord Pavilion on the first date of his "End Times Tour". The stage was covered in its entirety with a heavy black curtain allowing Manson to slip onstage unseen by the audience. Loud cheers of anticipation erupted, and the dark obstacle soon gave way allowing fans to get their first glimpse of Manson dressed in all black, with short, asymmetrical hair, and his signature pale make up. With the first notes of the opener "Deep Six", the second single from Manson's ninth studio album "The Pale Emperor" released earlier this year, screams got even louder for an appropriate welcome. Amidst clouds of thick smoke, an intent Manson energetically swung his mic around surely indicating that he was about to unleash a brutal visual and auditory attack on the over 10,000 Manson faithful in attendance. "Disposable Teens" (Holy Wood, 2000), "mOBSCENE" (The Golden Age of Grotesque, 2003), and "No Reflection" (Born Villain, 2012) all left fans screaming for more. Then followed a second and final song from his latest release "Third Day of a Seven Day Binge". Much to the pleasure of his fans, Manson has never been an artist to relentlessly push his new material making his shows a better qualitative experience as opposed to a shallow attempt to promote a new product. One of the classics that everyone was dying to hear was Eurythmics cover "Sweet Dreams (Are Made of This)" which first earned Manson substantial notoriety way back in 1995. Fans were not disappointed as the Ohio native appeared on stilts, a spectacle reminiscent of his entrancingly creepy music videos. From here on the tension continued to rise. During "The Love Song" (Holy Wood, 2000) the former music journalist posed behind a podium with a double barred cross logo, taking on a charismatic persona full of innuendos. Then, during "Lunchbox" (Portrait of an American Family, 1994), he simply sat on the floor delivering an exquisite vocal performance with intense screams. Although this show wasn't as extraordinarily outrageous as many of his past gigs, Manson wasn't ready to call it quits without some of his villainous spectacles he is so well known for. 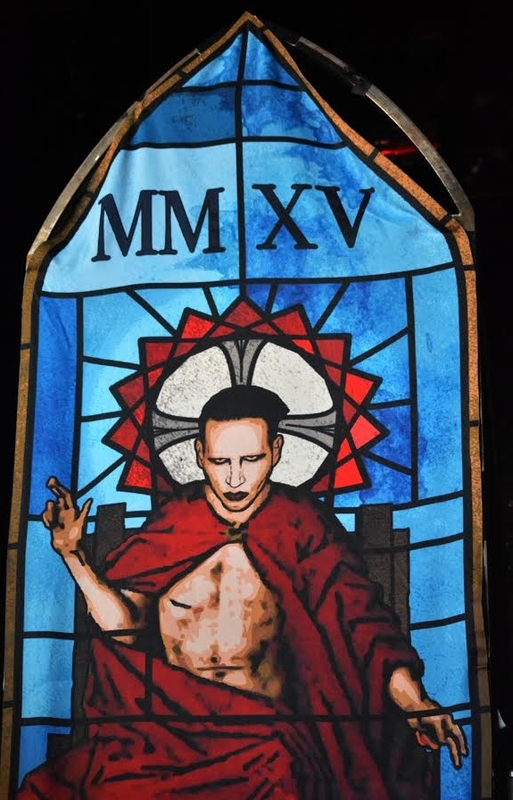 He performed "Antichrist Superstar", title track from his 1996 studio album, partly standing behind a second, even larger podium decorated with his infamous shock symbol, partly sitting and laying on top of it. The encore came way too soon but Manson didn't let up until the last note. He jumped into the crowd during "The Beautiful People," shaking hands and becoming acquainted with fans in the front rows. Finally, he jumped back on stage teasing long-time bass player and collaborator Twiggy Ramirez and knocking over a couple of floor lights before vanishing for good. This roughly one-hour long performance was too short, but sweet nonetheless. Co-headliner Smashing Pumpkins was on deck, and there was a curfew to be cared for. Despite the somewhat toned down presentation, this show was a Manson extravaganza, if you will, with special attention paid to the music and vocals like (possibly) never before. Rarely has Manson appeared so focused and determined. He was very much on top of his game. According to Manson's philosophy: May evil prevail, freedom of expression conquer conformity, and critics accept their insignificance.